These elegant pillows are made of 100% organic cotton certified by the Global Organic Textiles Standard (GOTS), and fore those who doesn’t know about the GOTS let me tell you that it is the worldwide leading textile processing standard for organic fibers, including ecological and social criteria, backed up by independent certification of the entire textile supply chain. 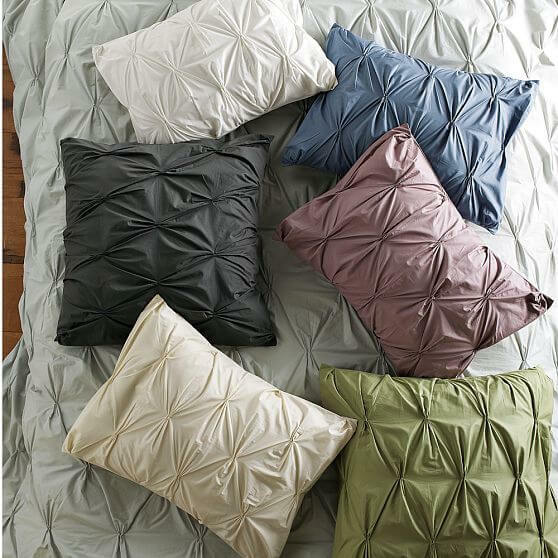 The west elm designers used a variety of textile colors from you to choose the perfect pillow that matches fore your bed like steel blue, slate, light amethyst, white, natural, sea spray and cactus. The sheets have an envelope closure with Duvet Cover: Button closure and four interior corner ties to keep the duvet in place. But I let you see the photos and see it fore you’re self what grate interior design with pillow decorating can become these elegant and soft pillows and sheets.